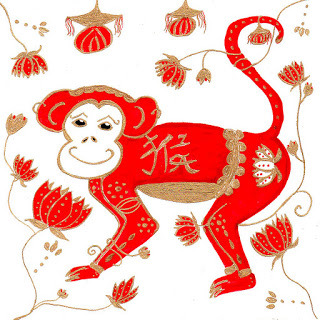 2016: Year of the Fire Monkey! Last weekend I was fortunate to be able to attend the Chinese New Year celebration at the Taoist Studies Institute in Seattle. The evening began with a wonderful array of Chinese food including roasted duck and scrumptious stir-fried vegetables. This was followed by a presentation about the construction of the new hand carved mountain gate (this is being erected next month at their 30 acre sanctuary in Snohomish, WA), a live calligraphy demonstration (a Chinese watercolor painting depicting plum blossoms), and as usual a few wonderful Taiji presentations by the resident teachers. Ending the evening was a New Year’s tale about clever (and foolish?) Monkey. Monkey is cunning, engaging and lively. In the story he searches for a teacher to learn the most impressive magic and eventually finds the best teacher in all the land. Monkey tries so hard to get his new teacher to reveal his deepest secrets, and for a long time the teacher resists Monkey’s charm. But through persistence and his cleverness Monkey eventually gets his way and learns all he wanted to know. Over the years Monkey used his advanced training to impress many people, but eventually he always managed to get himself into trouble. Reflecting back to his days with his noble teacher, he realized that the lesson he was supposed to learn first and foremost was to quiet his mind and cultivate stillness, and it is that lesson that would have prevented Monkey from getting in trouble over and over again. So this year, as you are enjoying the highly active and creative energy of the year of the Fire Monkey, don’t forget to create some stillness so that your exciting new ventures don’t get you into too much trouble. This is particularly important in the summer, when Monkey tends to be most restless and active.